Germ cell tumors often complicate uncorrected cryptorchidism with an incidence of 9.8% reported by Martin. Occurrence of pure yolk sac tumor however is uncommon in the undescended testis with only a few cases reported in literature. ,,, We present a case of yolk sac tumor in a 2-year-old boy in the undescended testis which was primarily diagnosed by fine needle aspiration cytology (FNAC). A 2-year-old boy presented to the pediatric surgical Out Patient Department (OPD) with 5 days history of a right sided abdominal mass. On examination the lump was 5 cm × 5 cm in size, firm in consistency with restricted mobility. It was situated in the right lumbar and iliac regions. Clinically, diagnosis of a renal mass? Wilm's tumor was suggested. On ultrasound, a tumor was noticed at the right renal hilum, causing ureteric narrowing with resultant hydronephrosis along with presence of multiple, large oval, heteroechoic lesions in the right iliac region and reteroperitoneum. Possibility of lymphoma was suggested. Due to the absent testis in the right scrotum, testicular neoplasm was not excluded. Ultrasound guided FNAC was performed. A blood mixed mucoid aspirate was obtained. Smears were highly cellular showing tumor cells in variably sized loose clusters with occasional cells forming glomeruloid structures [Figure 1]. The tumor cells were seen embedded in metachromatic basement membrane like material. Individual cells were large, showing moderate anisocytosis, high nucleocytoplasmic ratio. The nuclei were round to oval with irregular nuclear membranes, coarsely clumped chromatin and 0-1 nucleoli. Cytoplasm was moderate in amount and vacuolated in a few cells. There was abundant mucoid material in the background with presence of intracytoplasmic as well as extracellular periodic acid-Schiff (PAS) positive hyaline globules. Diagnosis of yolk sac tumor was made. This was corraborated by the raised alpha feto-protein (AFP) levels (>2000 ng/mL). Beta human chorionic gonadotropin (hCG) levels were within normal limits (1.61 mIU/mL). contrast-enhanced computed tomography (CECT) of the chest and abdomen were performed and revealed an elongated nearly oval shaped heterogeneously enhancing lesion in the right lower abdomen. Multiple heterogeneously enhancing retroperitoneal lymph nodes, right sided hydroureteronephrosis with left sided pleural deposits was also seen. In view of undescended testis, possibility of germ cell malignancy was suggested. Excision of the lump was carried out. A solid globular mass was received. It was gray to yellow in colour with some myxoid areas. Also present in the specimen were attached epididymis and spermatic cord. Sections were taken extensively and showed features consistent with yolk sac tumor with cells arranged in microcystic-reticular, myxomatous and focal macrocystic, alveolar-glandular and papillary patterns [Figure 2]. The rete testis, epididymis and surgically resected end of the spermatic cord were free of tumor. A single focus of lymphovascular invasion was identified. The tumor was seen reaching upto the tunica albuginea and showed a focal breach. Intracytoplasmic and extracellular hyaline globules present in the tumor were PAS positive and diastase resistant. The individual tumor cells were positive for pancytokeratin on immunohistochemistry. CD30, epithelial membrane antigen (EMA) and carcinoembryonic antigen (CEA) were negative ruling out embryonal carcinoma and choriocarcinoma. The patient was started on chemotherapy and is currently under follow-up. Fine needle aspiration cytology is a useful first line of investigation to diagnose testicular masses. It provides a triage of cases of testicular tumors into those who require surgery and those who do not. FNAC findings of yolk sac tumor of the testis have been reported previously. Smears are cellular with presence of cohesive clusters of very immature cells having basophilic cytoplasm and a prominent nucleolus. Glomeruloid structures, papillae and Schiller-Duval Bodies More Details may be seen. Presence of intra and extracellular PAS positive hyaline globules and a myxoid background are characteristic features. Strong et al. reported an endometroid variant of yolk sac tumor on cytology. Barman et al. reported yolk sac tumor of the undescended testis which initially presented with a mass in the left lobe of the liver. In the present case, FNAC provided a precise diagnosis of yolk sac tumor of the undescended testis which was clinically suspected to be either a renal or lymph node mass. This was confirmed on histopathology and corroborated with raised AFP levels. FNAC in conjuction with raised AFP levels is useful to diagnose yolk sac tumors and for planning further therapy. Malignancy associated with cryptorchidism peaks in the third or fourth decade of life. It may occur in early childhood as seen in the present case. Sinha et al. and Cox et al. 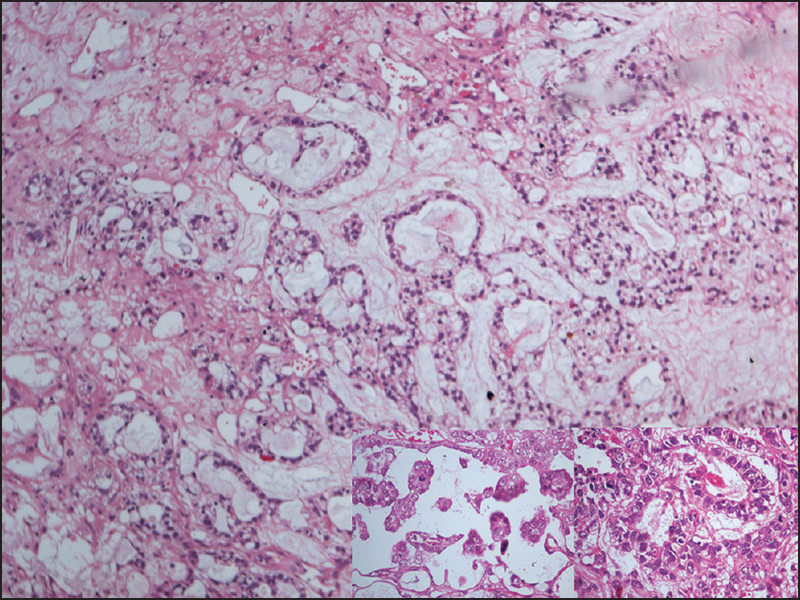 reported similar cases of yolk sac tumor in an undescended testis in small children. Testicular malignancy should always be ruled out when a cyrptorchid child presents with an abdominal mass. Mixed germ cell tumors occur frequently in the testis and only one component may be sampled on FNAC. The type of components present in the mixed germ cell tumor has major implications on the prognosis of the patient. Tumor markers like AFP, hCG, lactate dehydrogenase and placental like alkaline phosphatase are useful in making the diagnosis. However, the final diagnosis requires histopathology and confirmation with immunohistochemistry. Treatment and outcome of germ cell tumors in undescended testis is similar to those of germ cell tumors in general. Gullette et al. reported that survival among patients with testicular malignancy in descended and undescended testis was similar. The present case highlights the use of FNAC in diagnosing testicular masses, especially in our case where the lesion presented with multiple lymph node masses and renal hydronephrosis and was clinically and radiologically suspected to be a Wilm's tumor with metastasis or a lymphoma. FNAC is a useful, rapid and inexpensive tool, making it a first line of investigation in many hospitals. However, mixed germ cell tumors may be missed on cytology and should be correlated with clinical and radiological findings and serum tumor markers prior to surgery. Martin DC. Malignancy and the undescended testis. In: Fonkalsrud EW, Mengel W, editors. The Undescended Testis. Chigaco: Year book Medical Publishers; 1981. p. 144-56. Strong JW, Worsham GF, Baker AS, Hawk JC 3 rd , Austin RM. 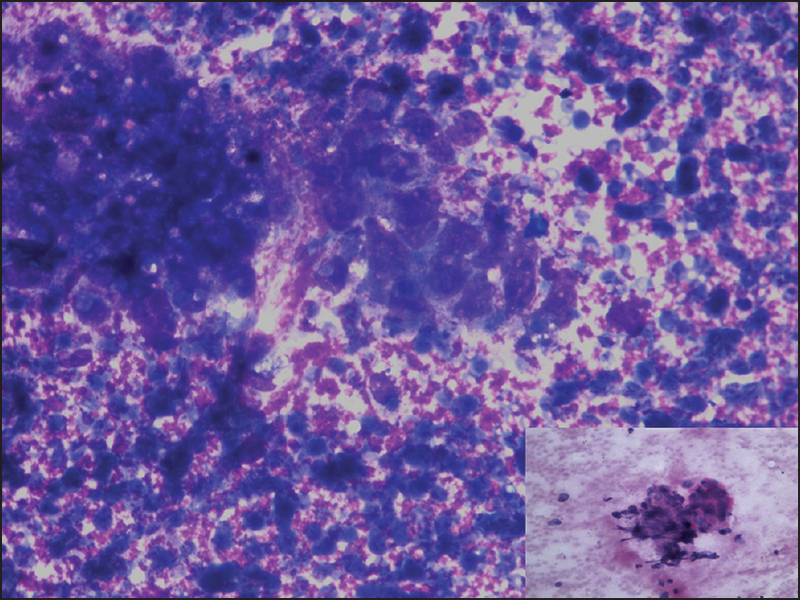 Fine-needle aspiration cytology of an endometrioid-like variant of yolk sac tumor. Diagn Cytopathol 1992;8:600-4. Barman DC, Halder A, Bhattacharya S, Mandal K, Mallick SK. Yolk sac tumour of the cryptorchid testis, with an unusual presentation - Diagnosed by fine needle aspiration cytology. J Clin Diagn Res 2013;7:1444-6. Sinha RS, Saha K, Ghosh G, Chakraborty DK, Bhattacharjee PK, Sarkar R. Yolk sac tumor of testis in a cryptorchid child: A case report. J Indian Assoc Pediatr Surg 2000;5:164-6. Cox L, Donald JC, Machin GA, Popkin JS, Zacks D. Intraabdominal testis with yolk sac tumor in a 2-year-old child. J Pediatr Surg 1988;23:775-6. Alshyarba MH. A giant intraabdominal testicular seminoma. Biomed Res 2010;21:227-9. Shrestha B, Baidya JL. Unresolved abdominal mass. Kathmandu Univ Med J (KUMJ) 2009;7:82-5. El-Husseiny G, Bazarbashi S, El-Weishi A, El-Foudeh M, Shouki M, Perracha A, et al. Germ cell tumors in undescended testis-prognostic factors and treatment outcome. J Egypt Natl Canc Inst 2001;13:209-14. Gullette NP, Mastersonb TA, Johnstone PA. Germ cell tumors of undescended versus descended testis: Population based clinical and outcomes data. Br J Med Surg Urol 2012;5:162-8.